There’s a view of Syria, common even among some peace activists in the United States, that because the United States has been making everything worse in Syria and the entire Middle East for years, Russian bombs will make things better. While the actions of the United States and its allies will lead to victory for the Islamic State, horror for millions of people, and chronic chaos in Syria along the lines of post-liberation Iraq and Libya, Russian bombs -- this view maintains -- will destroy ISIS, restore order, uphold the rule of law, and establish peace. I’ve been informed repeatedly that because I’m opposed to Russian bombing, I’m opposed to peace, I’m in favor of war, I want ISIS to win, I lack any concern for the suffering Syrian people, and my mind is either overly simplistic or somehow diseased. This line of thinking is a mirror image of the many self-identified peace activists in the United States who for years now have been insisting that the United States must violently overthrow the government of Syria. That crowd has even found itself aligned with President Barack Obama and Secretary of State John Kerry who in 2013 told the U.S. public that if we didn’t support bombing Syria, we were in favor of the Syrian regime murdering children with chemical weapons. To our credit, most of us rejected that logic. Advocates for U.S. bombs and advocates for Russian bombs each see a particular evil and wish to remedy it. The evil of the Syrian government, while often exaggerated and embellished, is real enough. The evil of the U.S. government, and what it has done to Iraq and Libya and Syria, can hardly be overstated. Both groups, however, place their faith in violence as the tool for remedying violence, revealing deep beliefs in the power of force that are clearly at odds with professed commitments to peace. Dropping bombs kills and injures civilians, traumatizes children who survive, harms infrastructure, destroys housing, poisons the environment, creates refugees, fuels bitter commitments to violence, and wastes massive resources that could have gone into aid and rebuilding. These are all well documented facts about every past bombing campaign in the history of the earth. In theory, peace activists agree with these facts. In practice, they are not outweighed by other concerns of realpolitik; rather, they are avoided entirely. When the U.S. bombs a hospital in Afghanistan, we’re outraged. When Russia is accused of bombing a hospital in Syria, we avoid knowing about it. (Or, if we’re from another camp, we put on our outrage for Syrian bombs but imagine U.S. bombs planting little flowers of democracy.) In wars that we oppose, we debunk claims to precision from the bombers. But good bombs are imagined has hitting just the right spots. After so many endlessly drawn-out U.S. wars that were advertised as quick and easy, we’ve begun to recognize the unpredictability of campaigns of mass murder -- and yet awareness of war’s unpredictability doesn’t seem to play at all into praise for Russian bombers joining in an already chaotic civil/proxy war. The United States is accusing Russia of murdering people it armed and trained to murder different people. Some of those people are now asking for missiles with which to shoot down Russian planes. Russian planes have nearly come into conflict with Israeli and U.S. planes. A major figure in the Ukrainian government wants to help ISIS attack Russians. Members of Congress and pundits in the United States are urging conflict directly with Russia. Warmongers in Washington have been working hard to stir up conflict with Russia in Ukraine -- now their hope lies in Syria. Russian bombs only heighten U.S.-Russian tensions. When you unscramble the chaos of forces, and questionable claims about those forces, on the ground in Syria, some facts stand out: The United States wants to overthrow the government of Syria. Russia wants to maintain the government of Syria, or at least protect it from violent overthrow. 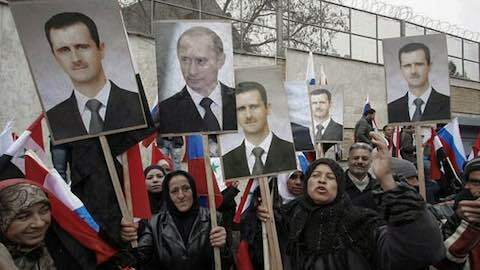 (Russia in 2012 was open to a peace process that would have removed President Bashar al Assad from power, and the United States dismissed it out of hand in favor of his imminent violent overthrow.) The United States and Russia are the world’s major nuclear powers. Their relations have been deteriorating rapidly, as NATO has expanded and the U.S. has orchestrated a coup in Ukraine. A war with Russia and the United States on different sides, and all sorts of opportunities for incidents, accidents, and misunderstandings, risks everything. Russian bombs solve nothing. When the dust clears, how will the war be ended? Will Russian bombs leave behind generous good-willed people eager to negotiate, unlike U.S. bombs, which leave behind anger and hostility? We’ve learned to ask the U.S. government to spell out its “exit strategy” as it dives into each new war. What is Russia’s? Here’s my position: Murder isn’t moderate. You cannot find “moderate” murderers and engage them to kill extremist murderers. You cannot bomb the extremist murderers without producing more murderers than you kill. What’s needed now, as in 2012 when the United States brushed it aside, is a peace process. First a cease fire. Then an arms embargo. And a halt to training and providing fighters and funding by Turkey, Saudi Arabia, Qatar, the United States, and all other parties. Then major aid and restitution, and a negotiated settlement in which, in fact, Russia should be included -- as it is located in that region of the world -- and the United States should not, as it has no legitimate business being there. This is what has been needed for years and will continue to be needed as long as it is avoided. More bombs make this more difficult, no matter who’s dropping them. Article: Republished with permission of Foreign Policy in Focus. "Why Peace Activists Should Stop Cheering for Russian Bombs in Syria"